Special Offer. Buy 2 Bottles for £250.00 each. Save £20.00 !! A pale pink-gold colour and an exquisitely fragrant bouquet are the prelude to an abundance of fresh, exotic flavours. Notes of wild berries, ginger, pepper, quince jelly and Peony. 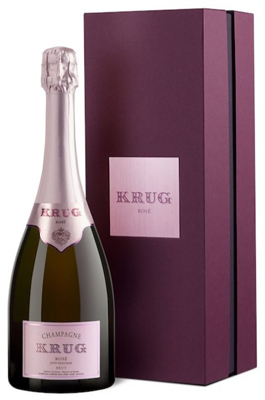 Krug Rose is a sublime demonstration of the Krug art of blending. Its vibrant personality is brought to life by combining a small quantity of precisely selected, skin-fermented Pinot noir grapes with traditionally fermented Pinot Noir, Chardonnay and Pinot Meunier. In any one year, the blend includes a significant amount of reserve wines to ensure a consistent harmony of style.